If you really just wanted to get rid of a whole lot of cash fast well then you’ve found the proper method. Of course after you’ve spent all of that dough and are worried about paying for other things, you can lay in your brand new tub and relax away all of those worries. As long as you can pay to keep that hot water coming in, you’ll be just fine. With all the features this tub includes you could spend a whole lot of time making your skin nice and pruney. 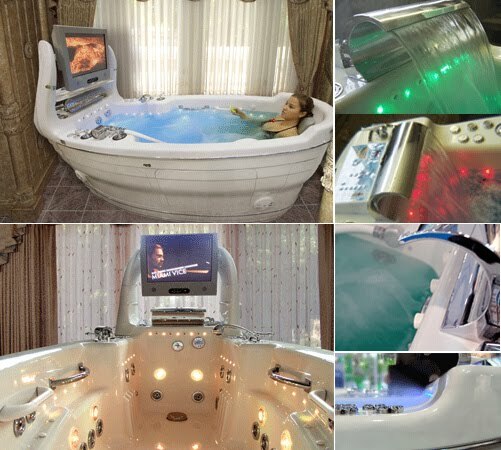 This tub features an integral splash protected TV system, with a splash protected remote control. If that weren’t enough it has a marine grade DVD/CD player with four 100W speakers. Under the water it has a high-gloss acrylic and chrome finished body. In addition to that are six access doors, 25 hydro-air jets, 12 jumbo jets, 12 medium jets, 8 small rotational star jets and 4 ozone jets. To keep those jets running properly it has 9 therapy modes and over 50 different therapy combinations. You can even choose a scent that includes everything from lavender to eucalyptus to watermelon. It also has LED lights and a waterfall spout. Right now there’s not a ton of word on the price, but you can expect to be forced to offer up not only your first but your second born child as well to get your hands on one.